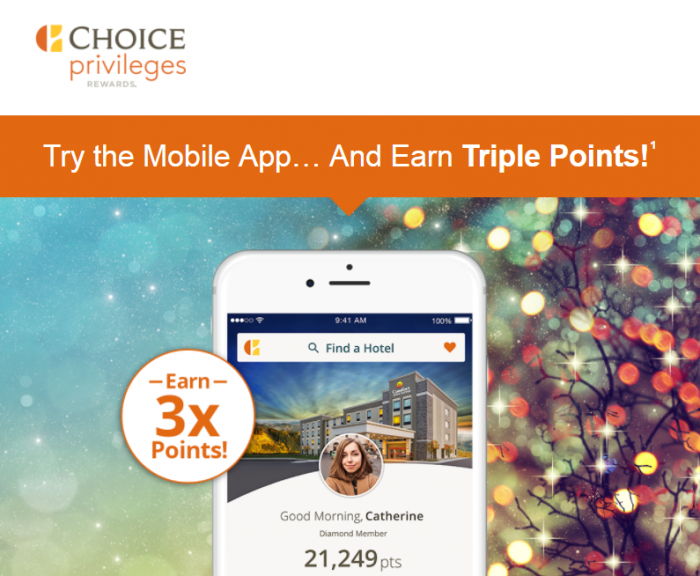 Choice Privilege’s has been emailing select members with targeted triple bonus offer for trying to get them to download the app start make bookings using it. 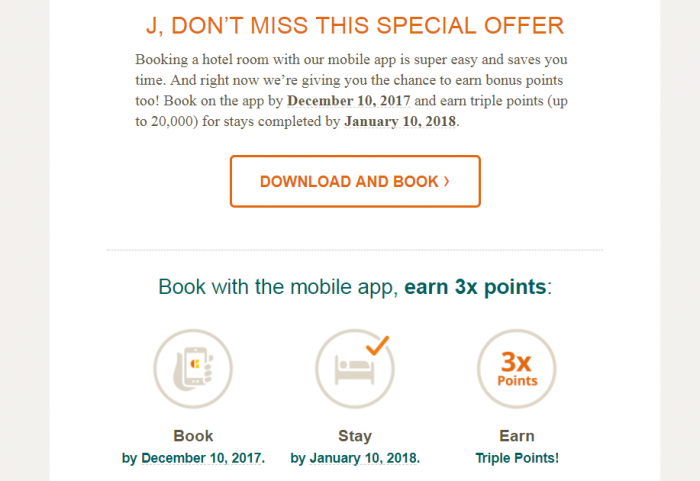 These targeted members earn triple points for app bookings through January 10, 2018, if booked by December 10. You can access Choice’s website here. Outside of Nordic Choice properties, I cannot remember the last time I would have stayed at Choice affiliated hotel. I received this offer from Choice and received it from a reader too. Choice must have sent it to those members that have been fairly infrequent Choice customers. Must be a Choice Privileges member. Hotel reservations must be booked through the mobile app between 11/1/17 and 12/10/17 and stay completed by 1/10/18. Members will be awarded triple bonus points for every qualifying stay, up to a maximum of 20,000 bonus points. A stay includes all consecutive nights at the same hotel regardless of check-ins or checkouts. Qualifying stays exclude rooms booked below certain rates, complimentary rooms, rooms paid for as part of a convention or meeting, rooms booked through a travel agent or third party online retailer as part of pre-paid wholesale rates, wholesale packages and senior tours. Stays at vacation rental property locations do not qualify for promotional bonus points. Not valid for previously booked reservations. Members must set their earning preference to ChoicePrivileges points in their online account, and this preference must be kept until the bonus points are awarded. Any change made to earning preference will remain in effect unless members make another change in their online account. The bonus points will be added to the member’s account within 3–4 weeks after the promotion ends on 1/10/18. Choice Hotels reserves the right to change or discontinue this offer at any time. Available to U.S. residents only. For ChoicePrivileges program details, eligible rates, eligible countries and point redemption rules, visit www.ChoiceHotels.com/CPrules. Email offer is valid only for use by and for intended recipient. Access to or use of this email offer by anyone else is unauthorized and will not be eligible to receive bonus points. Hotels are independently owned and operated.